Before we go to the games of the 9th round, let’s see what Garry Kasparov has to say on Twitter about the Candidates tournament so far. Garry Kasparov, at a press conference during the 2012 world championship in Moscow. The games today: Anand-Topalov, Karjakin-Kramnik, Andreikin-Svidler and Mamedyarov-Aronian. Peter Warne has other plans this Sunday: @peterwarne29: “I’m literally going to do nothing today #Candidates2014 #MSR #SonyOpenTennis“, and added: “did go to church of course! #catholic“. “Today is the little-known Siberian festival, “National Bloodbath Day”, according to @unudurti. And it was worth watching the Candidates today since there was some early excitement in the game Karjakin-Kramnik:“Looks like Kramnik sacrificed a pawn, but computer thinks it’s a bluff. 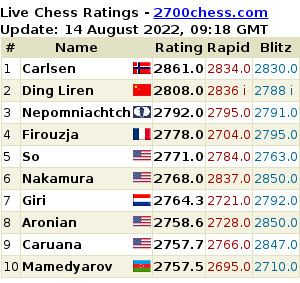 Karjakin clearly better?” tweeted @TarjeiJS (does he ever sleep?) Simon Louchart added @MyChesstrai: “Did Kramnik blunder against Karjakin allowing Qxb7 ?”” Kramnik doesn’t seem too happy with his position, I wonder what he overlooked when playing dxc4″, @Chess_Anyone tweeted. “I think Kramnik needs a strong cup of espresso”, @jimji87 suggested. The live stream from the official site is popular: @hadacostac: “Don’t you think they walk a lot instead of being concentrated on their own game?Peter is going to open a hole in the floor!” @palonsofig: “So funny watching Anand, Svidler and Krammnik all three looking at Mamedyarov-Aronian game like… WTF? ?” @hdacosta: “Maybe if Peter spends more time sitting, he could achieve a better game against Andreikin”. Interesting tweet here from @kkarra99: “What’s happening in Mamedyarov-Aronian game? “Have 7% battery, can’t watch the game 🙁 “. Enough battery to tweet, obviously?! Meanwhile, in Karjakin-Kramnik: “Karjakin and Kramnik working on a plan to put spectators to sleep.” according to @TraderDXB. Grandmaster Pavel Eljanov @Eljanov: “It’s fun that after Kramnik’s statement that 3.Qb3 yesterday was complete trash he quickly collapsed today in similar harmless line”, followed up by: “OK, he is not completely lost yet but his play looks strange to put mildly #modesty“. The next game to finish was Mamedyarov-Aronian: “Vishy looked very shocked when he came to know that Aronian resigned”, according to @Midzorgies. “Mamedyarov is a great player, great ideas!! !”, tweeted @Luisrf75. @unudurti: “@ShahriyarMamedy played a blinder of an innings as we say in cricket”. Two more games to go:@MathCasualty: “Both Topalov and Kramnik are both stubbornly clinging on with little hope of saving their positions”. However, the games did not take that long anymore: “What a stunner! @vishy64theking now in a great position to win #Candidates2014! Who would have thought at the start‽ Now, this is inspiring!” @kau. @MarkTWIC: “Anand has played very much within himself. Some of the others have played like children who’ve eaten too many smarties”. And what do the Norwegians think? @aegirr: “Det går mot Anand-Carlsen, Anand knuste Topalov i dag- Carlsen er kanskje glad for å ikke møte Aronian eller Kramnik”. Agreed. Google translate is my friend. Kramnik played a few more moves, but resigned after Anand and Topalov finished their press conference. @MarkTWIC: “Karjakin 1-0 Kramnik. I think they call this moving day in golf. Qualification is now very much in Anand’s own hands”. @AntSouz: “Phenomenal! Another great display of fine art! “Congratulations to Karjakin”. “Karjakin is an amazing player, his last two games were awesome, he made a huge come back after slow start.”, tweeted @midzorgies. @Eljanov: “With short but confident steps the wise man Vishy is close to become inaccesible now.”@anbhanna: “and Magnus is licking his lips…”@generickid1: “Magnus vs Anand II: the least anticipated rematch in history? !” Jacques van Delft, @jacquesdpa: “After today’s games I need a day’s rest as well….. Well done Viswanathan Anand!! But there are five more rounds to go and TWIC editor Mark Crowther @MarkTWIC has a Sunday Message: ” Before anyone anoints Anand as the winner of this event they should remember how bonkers things went in London at the end”.